You can't go wrong with this tasty cake! 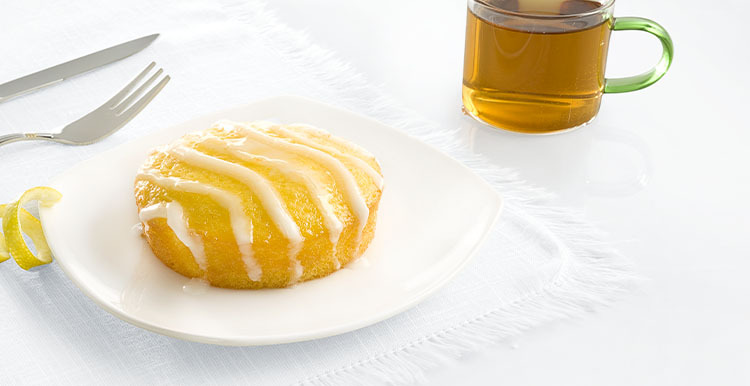 A soft cake and lemon glaze both bursting with tangy lemon flavor. The ultimate topping to a delicious meal! CONTAINS: EGG, MILK, SOY, WHEAT. MAY CONTAIN: TREE NUTS. Ingredients: NONFAT MILK, ENRICHED BLEACHED CAKE FLOUR (WHEAT FLOUR, NIACIN, REDUCED IRON, THIAMINE MONONITRATE, RIBOFLAVIN, FOLIC ACID), EGG WHITES, FRUCTOSE, SUGAR, RESISTANT MALTODEXTRIN, GLYCERINE, SOYBEAN OIL, WHEY PROTEIN CONCENTRATE, FAT REPLACER (WHEY, MONO-AND DIGLYCERIDES, OAT FIBER, MODIFIED FOOD STARCH, POLYSORBATE 60, SODIUM CASEINATE, DIPOTASSIUM PHOSPHATE, DATEM, XANTHAN GUM), AND LESS THAN 2% OF BAKING POWDER (SODIUM ACID PYROPHOSPHATE, SODIUM BICARBONATE, MONOCALCIUM PHOSPHATE), MODIFIED CORNSTARCH, NATURAL FLAVORS, SUGAR, STABILIZER (SUGAR, MALTODEXTRIN, AGAR, SALT, LOCUST BEAN GUM), SALT, CORN SYRUP, BETA CAROTENE COLOR, SOY LECITHIN, PALM OIL, XANTHAN GUM, GUAR GUM. Nutrients: NONFAT MILK, ENRICHED BLEACHED CAKE FLOUR (WHEAT FLOUR, NIACIN, REDUCED IRON, THIAMINE MONONITRATE, RIBOFLAVIN, FOLIC ACID), EGG WHITES, FRUCTOSE, SUGAR, RESISTANT MALTODEXTRIN, GLYCERINE, SOYBEAN OIL, WHEY PROTEIN CONCENTRATE, FAT REPLACER (WHEY, MONO-AND DIGLYCERIDES, OAT FIBER, MODIFIED FOOD STARCH, POLYSORBATE 60, SODIUM CASEINATE, DIPOTASSIUM PHOSPHATE, DATEM, XANTHAN GUM), AND LESS THAN 2% OF BAKING POWDER (SODIUM ACID PYROPHOSPHATE, SODIUM BICARBONATE, MONOCALCIUM PHOSPHATE), MODIFIED CORNSTARCH, NATURAL FLAVORS, SUGAR, STABILIZER (SUGAR, MALTODEXTRIN, AGAR, SALT, LOCUST BEAN GUM), SALT, CORN SYRUP, BETA CAROTENE COLOR, SOY LECITHIN, PALM OIL, XANTHAN GUM, GUAR GUM.